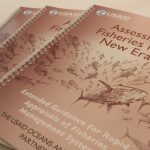 USAID Oceans conducted a second installment of at-sea data capture technology and provided technical assistance to its First Mover partners in Bitung during October 22- 26, 2018. The installed Pointrek technology is a two-way communication vessel monitoring system (VMS) with real-time catch reporting that enables fishers to capture seafood traceability data directly at its point of catch. 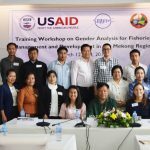 Following installation, USAID Oceans conducted trainings with its First Mover partners to simulate the use of the technology. 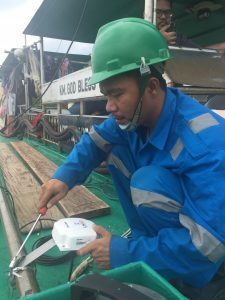 With the transponders, vessels are not only able to transmit catch documentation and traceability data at-sea, but also can communicate with business partners and family members onshore via mobile applications available on USAID Oceans-sponsored tablets. The training was conducted with two First Mover companies, PT. Nutrindo Fresfood International and PT. 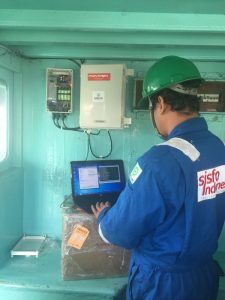 Sari Usaha Mandiri, and provided simulations of using the Pointrek devices that were installed on five fishing vessels throughout the week—three on long line vessels from PT. 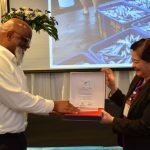 Nutrindo Fresfood International and two on pole and line fishing vessels from PT. Sari Usaha Mandiri. 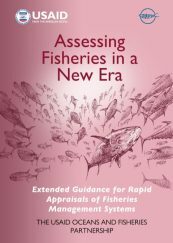 The training also convened local stakeholders from the provinces of North Sulawesi and Bitung, including from academic institutions, local government representatives, vessel captains, as well as fishers and other users who expressed that they believe that the technology could bring tremendous advantages to local fisheries. According to the participants, the technology facilitates collection of data that is needed in their reporting to partner companies, the government, and other relevant stakeholders. At the training, USAID Oceans provided technical support on data input, tracking of the vessel locations, processing the e-logbook and the use of two-way communication messaging feature as well as other features including the GPS (Global Positioning System), Multi Maps References, Weather Information System, Geo Fencing and “Track Back” Information System. 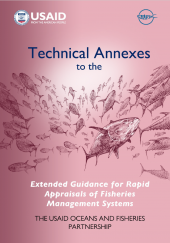 Looking forward, USAID Oceans will continue to support the development and installation of Pointrek technology with its First Mover partners to support the implementation of a transparent and financially sustainable electronic catch documentation and traceability system (eCDTS) to ensure fisheries resources are caught legally and properly documented.